Take I-40 to Raleigh. At the I-40/440 split, bear left onto 440 West. Travel 6 miles to the Gorman Street exit (Exit 295) and bear right. At the bottom of the exit ramp, take a right and travel 3.2 miles on Gorman Street to Hillsborough Street. Take a right onto Hillsborough Street and travel 1 mile to Lampe Drive (seventh stoplight). Take a right onto Lampe Drive. Patterson Hall will be directly in front of you. Bear left and then turn right for parking. 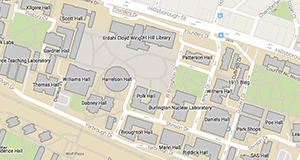 Limited metered visitor parking is located in front of Patterson Hall. Take Interstate 40 to Raleigh. As you approach Raleigh, bear right onto Wade Avenue exit (Exit 289). Travel 3.5 miles on Wade Avenue to Faircloth Street (third stoplight). Take a right onto Faircloth Street and travel .5 mile to Hillsborough Street (next stoplight). Turn left onto Hillsborough Street and travel 1 mile to Lampe Drive (seventh stoplight). Take a right onto Lampe Drive. Patterson Hall will be directly in front of you. If you have secured a visitor parking space in advance bear left and then turn right for parking. Otherwise please utilize metered parking located in on Hillsborough Street.